What Are the Characteristics of a Good Child's Pony? Your goal should be to find a pony that is safe and dependable. A first pony should be easy to handle and ride. 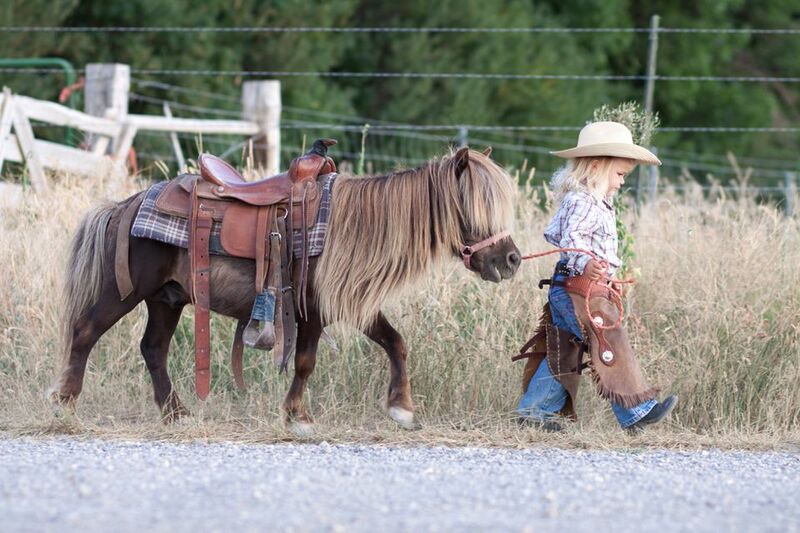 You'll want a pony that will build your child's confidence so that he or she can learn and have fun without being afraid. Good ponies are almost more difficult to find that good horses. This is because it's hard for most adults to train and ride ponies in a way that makes them well schooled and obedient. They're not impossible to find, though, and here's what you'll want to look for. Well mannered on the ground and when ridden. Ideally, over the age of 10. Sometimes you have to compromise. You might think it would be nice if your child had a young pony to 'grow up with'. But a beginner rider on a young pony can be dangerous. Ponies are clever, and a young pony may quickly take advantage of a beginner rider. An older pony, who has learned to be obedient would be the safer choice. You may have a choice between a very pretty pony that's not well trained or is flighty and a pony with a quiet nature that has a slight unsoundness and isn't so attractive. It's not unusual for ponies to founder or sometimes they have other soundness issues. While not ideal, these may not be negatives if you're willing to care for it properly. Sometimes, slower is better in a first pony. If you want your child to be safe, build confidence and have fun right now, you'll pick the latter. First ponies might not be the prettiest ones either. Try not to pick a pony for its attractive color, cute face or flashy markings. Temperament and manners are far more important. The enjoyment and safety your child will have will far outweigh the attractiveness of the pony. The size of the pony should match the size of the child. Ponies come in a range of sizes. It shouldn't be hard to find one that suits your child. Plan for a first pony to be suitable for your child for about two or three years before it is outgrown. The pony may then be suitable for a younger child in the family. It may be tempting to buy a horse or pony that your child will 'grow into'. However, if your child has to struggle to reach up and groom, bridle, and saddle or deal with a horse or large pony that is just physically intimidating, they may lose interest or get hurt. A fall, even from a standstill, on a tall horse might be scarier for a child than a tumble off of a shorter pony. Two or three years may sound like a very short time and selling a pony can be hard on the heart. But, better tears shed over parting with a beloved first pony because it has come to mean so many good things, then tears shed because the child was scared or hurt.